Here he is, boys and girls, The Amazing Kreskin!!! Does he win the cutest Candy Mentalist prize or what?! The Amazing Kreskin is a fabulous performer in a class by himself who has had some hugely popular television series in the U.S., Canada, and abroad, written several great books, put out several games for kids, has a diabolically fun new DVD you just have to get because it shows how you can do some of the amazing things he does, and he can often be seen making wildly fun guest appearances on The Late Show with David Letterman and other great shows. He even played a hypnotic priest in a recent indy flick called Horror--I will never forgive The Academy for not handing a Golden Boy over immediately! I absolutely love his enthusiastic personality and his great smile, and if you ask me, he is totally the coolest dude that ever walked planet Earth. 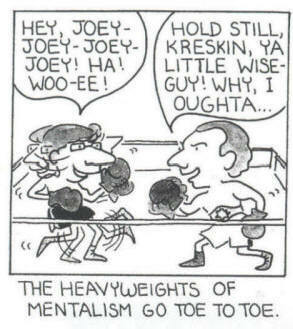 I saw Kreskin for the first time in college, when Joe took me to his campus show. It was a blast! He was awesome. Years later, I wrote him a letter and told him about it, and asked if he was going to do another show here. One day not long after, his manager Milt called and invited us to come and meet Kreskin in the lobby of the Fairmont Hotel. It was one of the most wonderful things that ever happened to me! He was so lovely and warm and fun, and as we were talking, the piano player tickling the ivories in the lobby happened to play "The Wind Beneath My Wings." You know, "Did I ever tell you you're my hero...?" Guess who put him up to it? It wasn't us! Kreskin is a God! 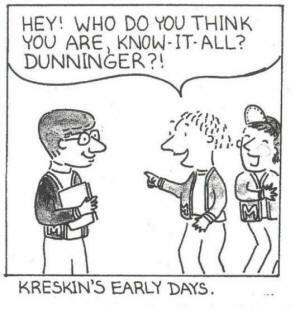 Here are two cartoons I did about Kreskin. I love drawing him!